The facelifted Hyundai Elantra has made its global debut and the sedan will arrive in India sometime next year. The Elantra looks a lot sharper than the version it replaces, and similar stylistic cues are likely to be rolled onto its smaller sibling – the Hyundai Verna. While the all-new Verna was launched in India only last year, the year 2020 will be ripe for a facelifted model. 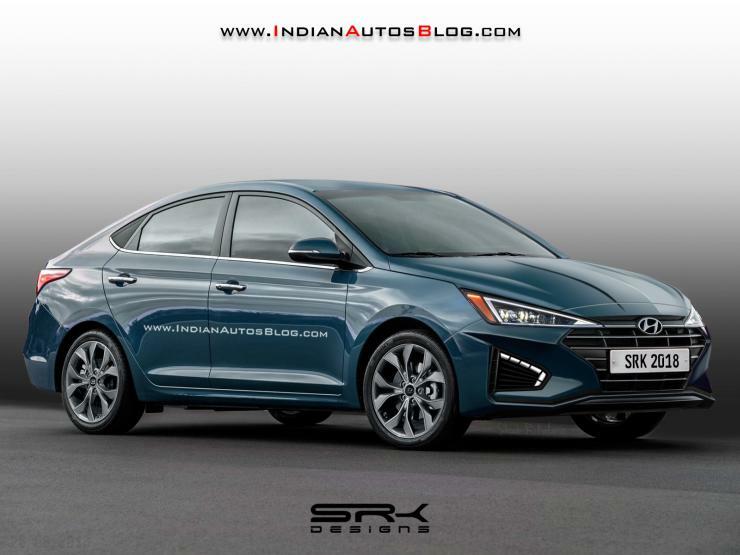 In 2020, the Hyundai Verna Facelift could look somewhat like this. Previous reports have already indicated that the facelifted Verna would get an extensive redesign, replete with sheet metal changes. The render indicates just that. From the headlamps to the bumper to the front bonnet and the alloy wheels, the facelifted Verna gets a slew of design changes. The profile remains the same though. At the rear too, expect extensive changes, including a new bootlid, tail lamps and bumper. Under the hood, the facelifted Verna will have changes meant to help it tide over the much tighter Bharat Stage 6 (BS6) emission norms, which come into force from April 2020. What this means is, it’ll get new petrol and diesel engines. Hyundai will introduce downsized petrol and diesel engines, with 1.5 litre capacities. However, these engines won’t lose much power despite the near 100cc downsizing, and will make over 110 Bhp each. The gearboxes of the cars are likely to be carried over, with both the petrol and diesel variants getting 6 speed manual and automatic options. The car will also prepare for hybrid powertrain options. A turbocharged petrol engine is also expected to be a part of the equation for the future. Other key changes on the facelifted Verna will be in the infotainment department, and the look and feel of interiors. Expect the facelifted car to be more tech-packed, with many features of the current Creta making it to the new Verna.